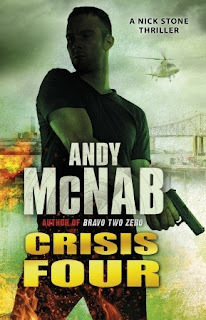 Goodreads: Crisis Four is Andy McNab's fourth book and his second work of fiction, but he has already established himself as a brand name. His trademark is the SAS and dirty operations, so it will come as no surprise to anyone that the hero, Nick Stone, is a hard but fair ex-SAS man, now working for £250 per day as a freelance agent for British Intelligence on undercover missions which will be denied if they go wrong. The basic story is relatively straightforward. Stone undertook a mission to Afghanistan in the late 80s with a mysterious femme fatale, the posh Sarah; they had a fling and she promptly dumped him on her return. In 1995, they meet up briefly on another undercover mission to Syria which starts to go horribly wrong as Sarah appears to be working to a different briefing. Then, in 1998, Stone gets a summons on his pager to meet his bosses at Gatwick. Sarah has gone AWOL from her apartment in Washington DC and Stone's job is to find her. This he ingeniously achieves quite quickly and there then follows a long, tense chase across the US. Sarah's true past, and the secret that she holds, is gradually revealed and the ending is truly gripping. I started reading remote control the first in the Nick Stone series because a friend mentioned him so I thought I would have a read, after finishing the first one I decided to read the second in the series, I am hooked! Even as I type I am ready have way through the third one that I started this morning! I am so excited that it is such a long series and I don't have to wait for any to be released! It’s not my normal type of book but amazing all the same! Nick Stone is trying to move forward with his life after the killing of his best friend and their family, after taking full custody of the one surviving daughter Kelly stone must do what is best for both of them including battling with child care and trying to work to keep them going. When he is called on a job and has to leave Kelly again he thinks his day can't get worse..... Until he sees who his Target is! Sarah is the one woman stone has ever been in love with and now she has gone missing. Stone has to go on a hunt to track her down and deal with their less than pleasant past. But when stone finds her is everything as it seems? Who is telling the truth in this game of cat and mouse? Will he carry out his job or let his feelings get in the way? Can stone make it out of this alive or will he have his heart destroyed again? Remote control was an excellent book but Crisis Four is even better! I loved following him on the hunt to find Sarah, not only was the story line fanatic but I found some of the weapons and survival techniques really interesting to read about. Then there was obviously lost of violence and action and amazing heart stopping moments! That is what I love about Andy McNab's writing is that you are constantly in suspense, you just don't know what is going to happen, or who if anyone is safe or who is a traitor. I also love that I can't predict the plot so you are hanging to the edge of your seat throughout the whole book! I just thing he is a fantastic writer! his books are just gripping, every page just keeps you reading because you want to see Nick make it but there are situations he gets in and you’re just going 'how is he going to get out of this one'. This book was just action, thrilling, heart stopping I cant even say how good it was! I just couldn't put it down! The more I read the Nick Stone series the more I like Nick! I think he is a brilliant male lead for an action storyline but what I do like is he isn't invincible, there are moments when he gets in trouble and there seems to be no way out, moments when you can see his feelings where hurt or he feels guilty for leaving Kelly and I think that just makes him all the more likable and also make it so you can have a connection with him. 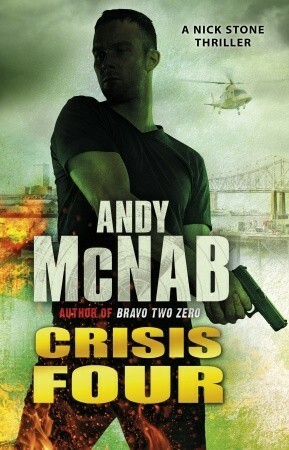 If you haven't read an Andy McNab book before what are you waiting for? I didn't think I would like it but once you have a taste for action, SAS stuff, spying and excitement you can’t put them down! This book was brilliant and I loved every minute, the twists and turns in the storyline were fantastic and the end was just amazing!